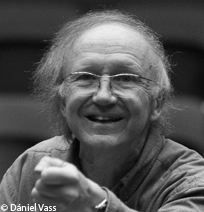 As a composer he has explored techniques of sound emission, of breathing control, of the production of noise textures (H, 1968; Pneuma, 1970; Atembogen, 1975). He has written for all genres, from solo instrument (Trema for violin, 1983) to large orchestra (S’irato, 1993), not forgetting vocal music (Nicht Ichts nicht Nichts, 2012) and stage works (operas such as Come and go, 1977; Schneewittchen, 1998). He accords most particular importance to the voice, to poetry and literature, with writers such as Samuel Beckett, Paul Celan and Hölderlin, whose pseudonym can be found in the imposing Scardanelli-Zyklus (1975-1991). A composer in search of truth, he has revisited (notably) Swiss identity (Puneigä, 2002; Induulchen, 2004), the past (Triple Hoquet, 2002; Claude Debussy : Ardeur noire, 2008), and has pushed back all instrumental, aural and structural limits, as well as shaken up the conventional form of the concert. Les partitions de Heinz Holliger sont éditées par Schott. ALBÈRA Philippe (dir.). Heinz Holliger : entretiens, textes, écrits sur son œuvre. Genève : Contrechamps, 2007, 397 p.
KUNKEL Michael. Ach, wär’ich bei den Zwergen doch : Lob-ABC für Heinz Holliger. Dissonance, 2009, no 105, p. 32-35. FENEYROU Laurent. Noli me tangere : une thèse en trois déclinaisons sur Heinz Holliger. L’étincelle, 2013, no 9, p. 10-13. Programme du festival Manifeste 2013.